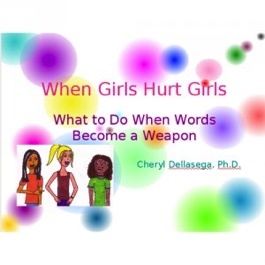 How Girls Hurt Girls is a PowerPoint presentation for those who want to stimulate discussion about relational aggression and friendship among girls. Appropriate for girls in grades 5-8, this presentation can be used alone or with activities in other Ophelia e-store resources. **Note: How Girls Hurt Girls is a PowerPoint presentation. You will need Microsoft PowerPoint (or a compatible program) to view it. This product is only available via download. You WILL NOT receive a physical copy if you purchase this item. 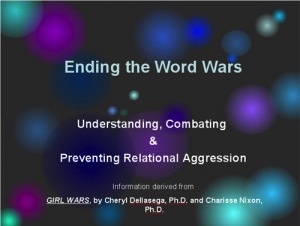 What to do When Words Become a Weapon is a PowerPoint presentation intended for adults who want to learn more about relational aggression (RA) and what to do about it. A great kick-off for an ongoing program on RA, you may choose to purchase the Girl Wars book and study guide to follow up on this introductory look at the world of girl bullying. Note: The files included in this purchase are provided in a zipped archive to speed up your download. You will need to unzip the files to use them. You can use the built in Windows unzipping utility, or download 7-zip, a third-party unzipping utility, for free by clicking here. 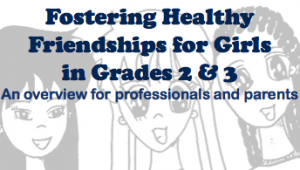 Fostering Healthy Friendships for girls in grades 2 & 3 is a PowerPoint presentation intended to educate and encourage dialouge among adults working with young girls. This presentation package is a great resource for teachers, coaches, parents or any other professional staff. This package comes with a slide show, presenter’s guide and introductory survey for the audience. This resource can be used alone, with other Ophelia e-store products and is the perfect supplement to use with the Miss O club curriculum. 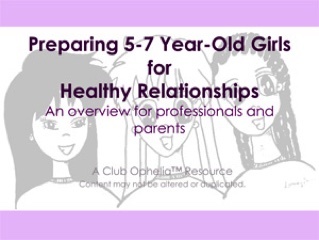 Preparing 5-7-Year-Old Girls for Healthy Relationships is a PowerPoint presentation intended to serve as the first line of communication about early elementary relationships. 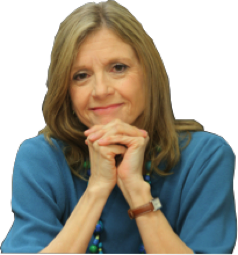 This presentation is suitable for teachers, aides, parents and community members who serve young girls. Material covered is designed to educate and encourage dialogue among adults. This package comes with a slide show, presenter’s guide, activity starters and an introductory survey for the audience. This resource is perfect for introducing the topic of friendship in the primary grades to an elementary school or other group and can be used alone or with other Ophelia resources.